Some animals and plants to look out for and notes on where they might be when you cant see them! 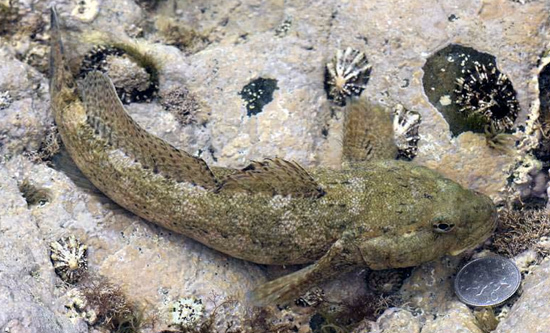 For some of Scilly’s wildlife, the sea is a barrier that prevents them from breeding with populations on the mainland. For those species, genetic differences that appear in the islands are more likely to persist within the island population. 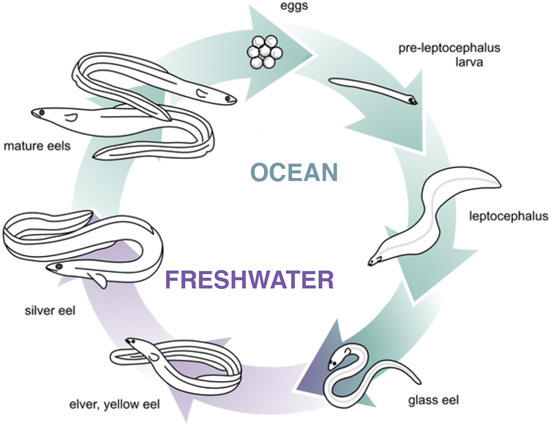 These differences build up with time and gradually after many generations of breeding in isolation they give rise to new and unique local species. 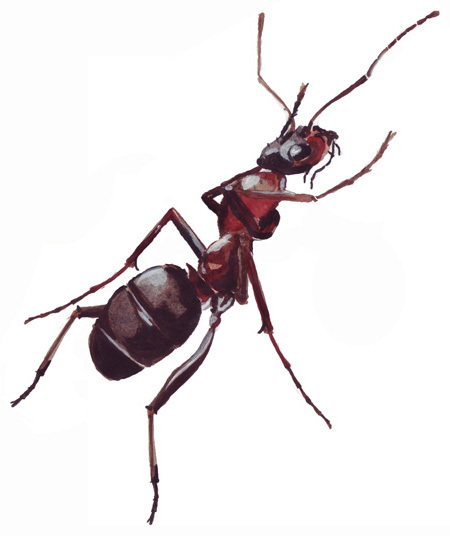 St Martins Ant Formica rufibarbis. 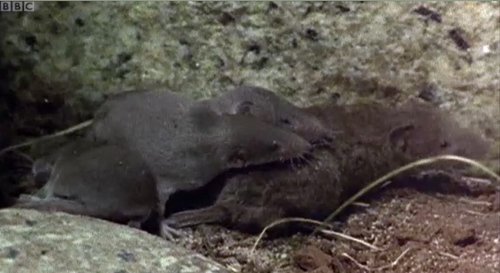 These are thought to be a subspecies of Lesser White-toothed Shrew that is found exclusively in Scilly. It is not known whether they date back to the last Ice Age or arrived more recently. One possibility is that they derive from a small founding population introduced by man after Scilly became cut off from mainland Britain and Europe - Read more about the Scilly Shrew. - a puzzle with a piece missing. In spite of their small size, the islands provide a range of different habitats that are home to a wide variety of plants and animals, for many of these, the islands provide a sanctuary free from large predators, pollution and frosts. Some species common in continental Europe are rarities or absent from mainland Britain, but are able to thrive in the warmer climate that Scilly enjoys. Scilly is the only place in Britain where you can find this plant. 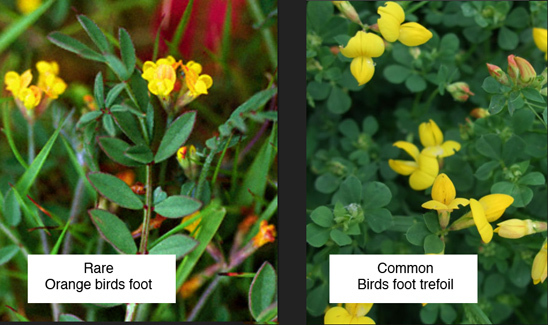 Its tiny deep yellow flowers, delicate leaflets and segmented seed pods help distinguish it from the abundant ‘Birdsfoot trefoil’ Lotus corniculatus. [Six spot burnet moth caterpillars feed on Birds foot trefoil and their yellow, spindle-shaped coccoons are often seen attached to long grass stems nearby.] 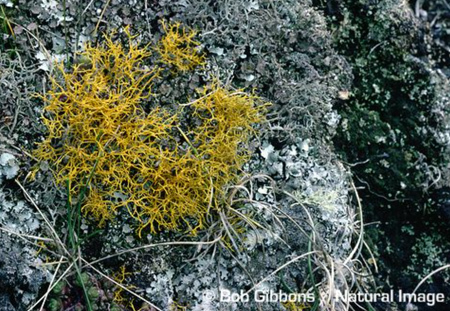 The Orange birdsfoot grows in short turf and can be found on Castle Down Tresco, Heathy Hill Bryher, and on St Agnes. 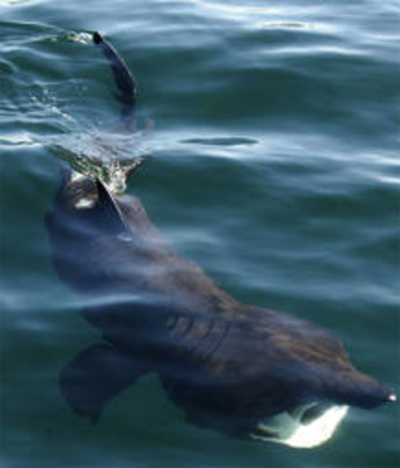 Scilly’s marine animals often travel considerable distances to feed. The exact movements of some larger birds, fish and mammals can be tracked by attaching mini transmitters which signal their locations via satellite. Tracking six female shearwaters over a two-day foraging trip illustrates the locations of the three main feeding grounds (figure to right). 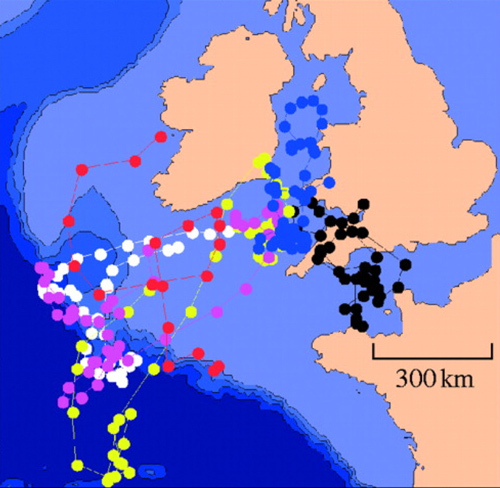 Each colour represents a different bird and the spot density shows how much time each bird spent in that location: the bird whose trip is shown as blue spots fed at the Irish Sea front, whilst the one shown as black spots fed along the Ushant front and the birds shown as white, pink and yellow spots fed off the Continental shelf (Guilford et al 2009). 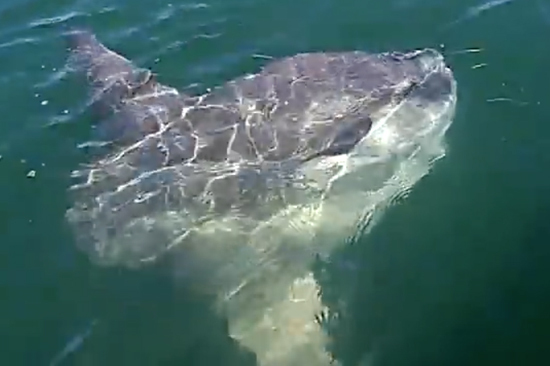 Various cetaceans feed around the islands. The three most abundant species around Scilly are Harbour porpoise, Common dolphin and Minke whale. 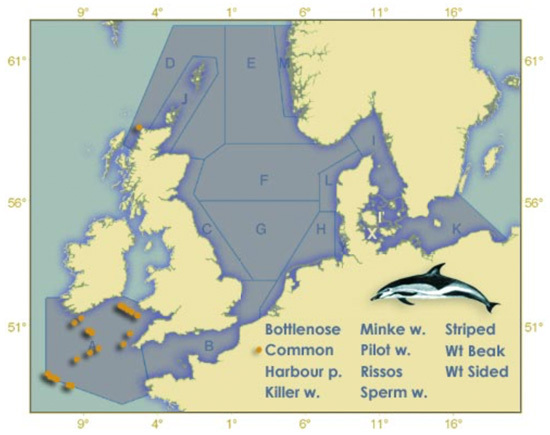 To minimise the numbers dying as bycatch in fishing nets, the numbers and locations of eleven cetacean species feeding around Britain and Ireland have been monitored, using sightings and acoustic surveys- you can see the results for the common dolphin to the right, and more on the SCANS II survey web pages. Cetacean strandings- occasionally cetaceans are found washed up on the shores. If you fiind one, please report it at ukstrandings.org For skeletons and badly decayed corpses, information on dentition can be crucial for identification. This skeleton (right) found near the Great Bay St Martins in 2015 was widely believed to be a pilot whale, although the lack of teeth indicates that it was a Risso's dolphin or a Beaked whale. Some birds, fish and insects migrate north to Scilly to feed or breed. These seabirds spend their winters in South America. They arrive in Scilly in March to nest in burrows on Annet and St Agnes and leave Scilly in July. A recent conservation project has successfully eliminated brown rats from St Agnes to improve the breeding success of the shearwaters and other ground-nesting birds. Crabs have exoskeletons which they shed as they grow. Many of the crab shells you find on the shore are these cast-off exoskeletons. Female crabs carry their eggs under their body until they hatch. 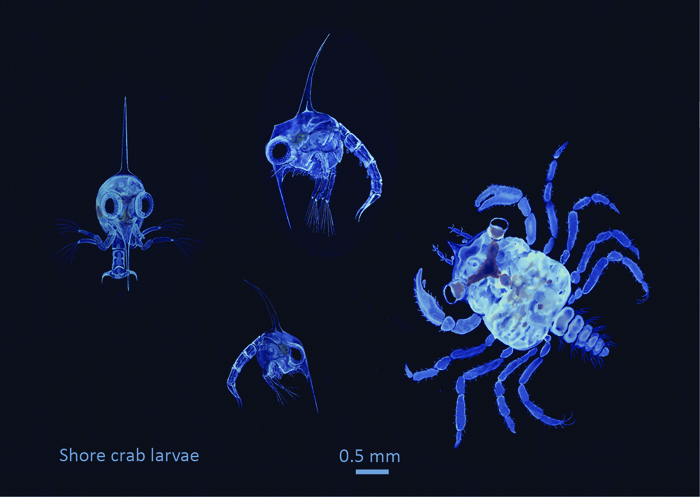 The microscopic larvae move up to the surface as the tide goes out and are carried out to sea. 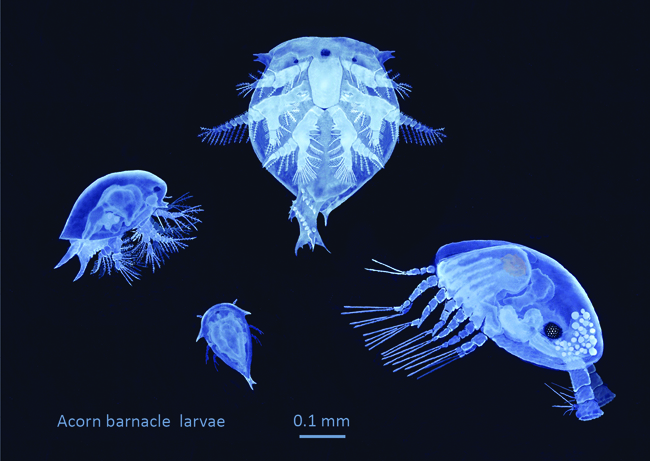 More >> After three weeks feeding at sea the planktonic larvae drift back in to the shore. The seashore can be a difficult place to live. Rising and falling tides bring alternating risks of being washed away and of desiccation. Two periwinkle species you can find in Scilly have different ways of ensuring their young survive. Littorina saxatilis lives high up the shoreline and protects its developing eggs in brood pouches inside its shell. Littorina obtusata lives lower down the shoreline where there is less risk of dessication, it sticks clumps of eggs to seaweed. In both these species, the eggs hatch into shelled young, thereby avoiding a planktonic phase. A third species, Littorina littorea, rarely if ever found in Scilly, broadcasts eggs and sperm which give rise to planktonic larvae. 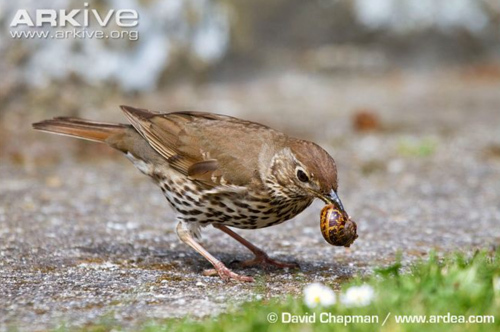 In Scilly, cuckoos often choose rock pipits' nests to lay their eggs in and in late July/August you may see these small thrush-like birds feeding a voracious parasitic cuckoo fledgling on coastal paths near the rocky crevices where the rock pipits nest (how cuckoos choose their hosts). 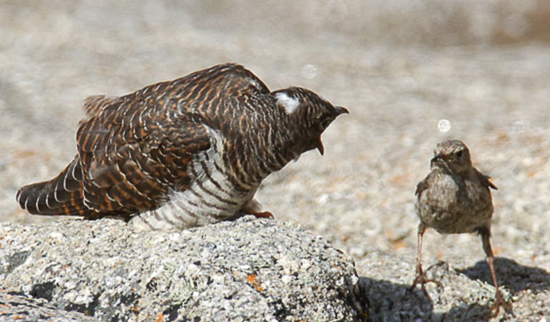 Cuckoos mimic the hosts' egg pattern when they lay, to reduce the chance that their eggs will be noticed and rejected. These beetles grow up to 3 cm long and can be seen on foot paths, burrowing into bare ground to lay their eggs. 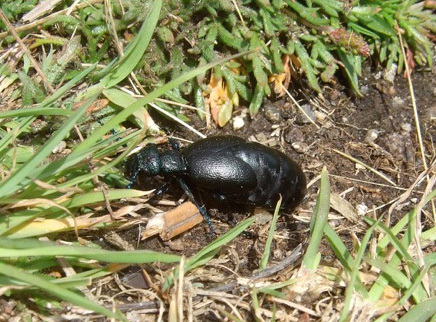 Black oil beetles parasitise solitary mining bees. On hatching, the young oil beetles crawl up into a flower to climb onto a visiting bee and then feed on the bee’s eggs and its store of honey and pollen. 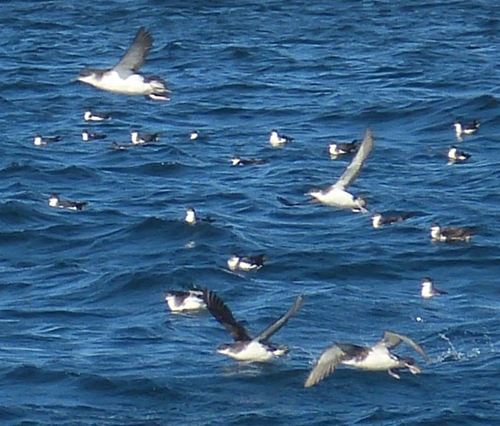 Shearwater journeys show main feeding grounds.